Images of OMR and Responses to the questions marked by the candidates. 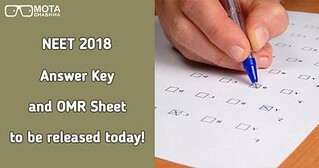 How to obtain the NEET Answer Key and Response Sheet? The candidates who appeared in the NEET exam can check their answer key and response to the questions marked by them by following the link available on this page. To get the answer key and response sheet, the candidates have to login into their account using their User ID (Registration Number) and Password. Moreover, the candidates do also have the option to challenge the NEET answer key, OMR grading of their sheet and test booklet code. The candidates can also challenge the answer key of NEET and OMR grading of their OMR sheet. After receiving the challenges, the CBSE will release the final revised NEET 2018 answer key. The decision of the CBSE in this matter will be final and no objection in this regard will be obtained. Candidates can download NEET answer key 2018 released by various coaching institutes from this table.